Officially on the bucket list: Rafting down the Grand Canyon and camping out on its rocky banks under a night sky illuminated by the Milky Way. Apparently, this is something you can really do by way of the Colorado River in Arizona, but you’ve gotta work for it: the National Park Service offers guided commercial river trips and a limited number of private whitewater rafting permits on a first-come, first-serve basis. But you might be more inclined to put in the effort after watching this incredible new time-lapse by Project SKYGLOW, which is hitting up hidden wonders around the United States as part of its ongoing journey to shed a proverbial spotlight on our nation’s light pollution problem. The video Mehmedinovic captured last July is blowing us away, too. Shot during a week-long, motorized riverboat trip from Lee’s Ferry to Bar-10 ranch in Grand Canyon National Park, Arizona, Mehmedinovic’s time lapse simultaneously captures the lackadaisical spirit of a summertime rafting getaway with the soul-shattering awe of seeing a slice of our spiral galaxy from one of America’s last remaining dark sky sanctuaries. 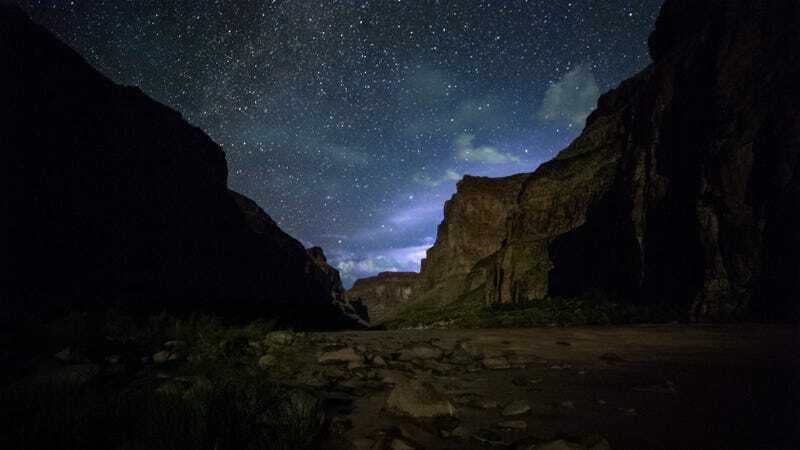 According to the National Park Service, Grand Canyon National Park was awarded Provisional Dark Sky Status by the International Dark Sky Association in 2016, and hopes to announce full Dark Sky Status in 2019. A park in central Idaho became America’s first full Dark Sky Reserve late last year, joining a dozen other such reserves as part of a growing movement to reduce skyglow, a brightening of the night by artificial lights that affects some 80 percent of the world’s population, and could be disrupting nocturnal animals and ecosystems. In its ongoing partnership with the International Dark Sky Association, SKYGLOW has grabbed some of the most awe-inspiring shots of the night sky in recent memory, including from Mauna Kea, Hawaii, considered the best spot for astronomy in the northern hemisphere, and from decaying ghost towns across the Old West. We hope they keep it up—we could all use a little more wonder in our lives.